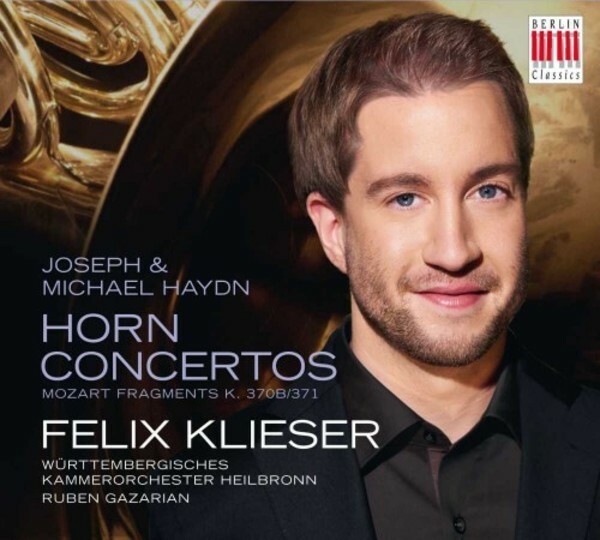 ECHO prizewinner Felix Klieser now follows his debut featuring Romantic chamber music with a second album: an orchestra recording of works by Joseph and Michael Haydn and by Mozart. This album is a Classical one! While the first of Joseph Haydn's two horn concertos calls for the high-register horn, the second was composed for its lower-tone brother. Horn players generally specialize in one or other instrument. Felix Klieser plays both. "Addressing the requirements demanded of players of both the high and low horn on one single CD was a challenge for me, but it was a task I relished: it meant I could present the full spectrum of the instrument's aural range", enthuses the young horn player, born without arms, who declared his wish to play the horn at the age of four. Unlike the concertos by his famous older brother, Michael Haydn's Concertino for Horn and Orchestra is seldom heard in concert. "That is such a shame, and unjust. Michael Haydn did not stick rigidly to the rules of the day governing such concertos, so his work sounds different. And yet it is really beautiful", according to Klieser. And Mozart? The closing horn concerto is one reconstructed from two fragments, and seldom played - one might call it Mozart's 'zero concerto'. "All of the works share a certain lightness and cheerful manner. That was the link that brought these three works together on one CD", explains the 27-year-old musician. In the renowned W�rtemberg Chamber Orchestra of Heilbronn under the direction of Ruben Gazarian he has found the perfect partner for his endeavour. "We worked on the music with a great degree of intensity and passion, as well as fun and enjoyment. May I invite you to share this enjoyment with me when you listen to the music."